If you haven’t yet visited Fountain Square to check out this year’s Flower Carpet then you need to hurry up as it will only be on display until Saturday, April 25th. 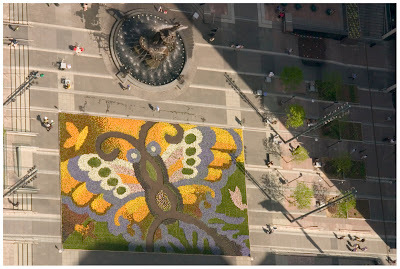 Cincinnati’s annual Flower Carpet started taking bloom in 2007 and is similar to the Biennial Floral Carpet in Brussels, Belgium. What happens each year is flowers take the form of a massive art project on Fountain Square and act as a “flower carpet” for several weeks until it is dismantled. This year’s display will be dismantled on Sunday, April 26th. Starting at 8am the public will be able to go to Fountain Square and take home some of the pansies used in the display for themselves – for free. In the mean time though you should go and check out the display. A great spot to view it from is the Carew Tower Observation Deck. It’s cheap ($2 for adults, $1 for children), offers unobstructed 360 degree views of Cincinnati and a great aerial view of the Flower Carpet and Fountain Square. Next articleLocal black community turning on Smitherman?